. Ise Grand Shrine 伊勢神宮 Ise Jingū . 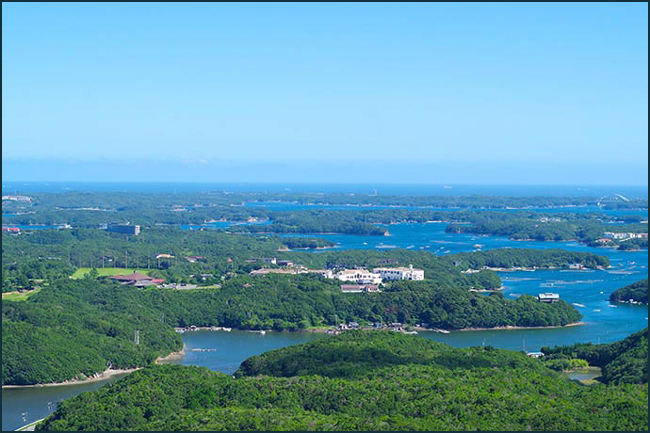 at the Shima Kanko Hotel in 賢島 Kashikojima Island, 英虞湾 Ago Bay, Shima, Mie Prefecture, Japan. Once a family had a lot of bad luck, one after the other, and finally asked a priest fro the 日蓮宗 Nichiren sect for advise. He told them one of their ancestors had once felled a pine at 三島山 Mishimayama and killed a serpent. Now they suffer from the curse of this animal, but when they started to venerate the serpent, things got better. hebigami 蛇神 "Serpent Deity" and things got better. there was an old couple doing their farming work near 城山 Shiroyama. They were talking about weather a deity would live in the pond or not. While they were talking, the water of the pond begun to swirl in a furious whirl. Since then they begun to venerate the "Deity of the Pond", which was in fact the Snake Deity. around 1825 in the villages of 船越村と波切村 Funakoshi and Nakiri there arose a fight about a whale who had washed ashore. The headman of Funakoshi insisted in his claim, even by cutting his guts and committing 切腹 Harakiri. Now there is a Jizo Statue to venerate in place of this headman. But the family which had placed the statue was struck by misfortune. When they asked a diviner about their problem, they were told that the statue faced toward Namikiri and Jizo was angry about that. So they turned the statue to face in the opposite direction. If children behave bad or do mischief in the presence of this Jizo statue, there will be no good catch for the fishermen (fusagu フサグ（不漁). with a legend from 1830 - 天保元年(1830)9月23日 about the villagers around Nakiri pilfering a shipwrecked boat. - - - - - . Nakiri Jinja 波切神社 Nakiri Shrine . and the kujira ishi 鯨石 "Whale Stone"
shiobotoke 潮ボトケ "Tidal Buddha" or nurebotoke ぬれボトケ "Wet Buddha". "I am the Jizo Bosatsu of this place. By a turn of fate I arrived here at this place. If someone prays to me with all their heart, I will heal any illness they have from the hips down to the feet. I will sleep in the sea water and thus help to cleanse the sins of the people, so do not replace my stone to a higher place." The head priest 児玉芳山 Kodama Yoshiyama of the temple 潮音寺 Choon-Ji in Shima decided to have a hospital here. 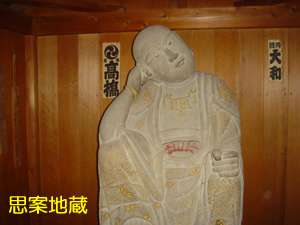 There is a temple of the same name, 潮音寺 Choon-Ji, in Toba 鳥羽市答志町. It has three Kannon Statues of three different periods, Heian, Kamakura and Muromachi. If a woman gives birth facing the Konjin deity 金神 the baby will be blind or eaven be born dead. Nagagami to appease it. Every month on the 14th day they have a special purifying ritual. fishermen make huge straw sandals of the size of one Tatami mat every year and float it on sea, together with sekihan 赤飯や酒 ritual red rice and Sake. There is a Demon living on a reef close by and when he sees the big Tatami, he thinks that there must be a huge Demon living on land. This stops him from coming to the shore and do harm to the village. The 鰹船 bonito fishermen once found a floating dead body near Oki but did not bother to haul it up with their nets. A few days later they saw a huge octopus （7、8尺四方） and more strange things begun to happen. Eventually all of the crew drowned, only the one man who had seen the dead body first survived. on the last night of the year, a Tengu comes and hangs a light on a tree. yonaki matsu よなき松 / 夜泣き松 "Pine crying at night"
During the 伊勢湾台風 Isewan Taifun an old pine tree of more than 1000 years broke down. When they cut it clean the tree begun to cry.
. Isewan typhoon 伊勢湾台風 1959 - Typhoon in the Isewan Bay - Legends . At the Shrine 加布良湖明神社 in 加布良崎 a white serpent is the Deity in residence. She is the couple together with the 山の池 white serpent from the pond in the mountain. On the last day of every month 毎月晦日 the two can meet late at night. 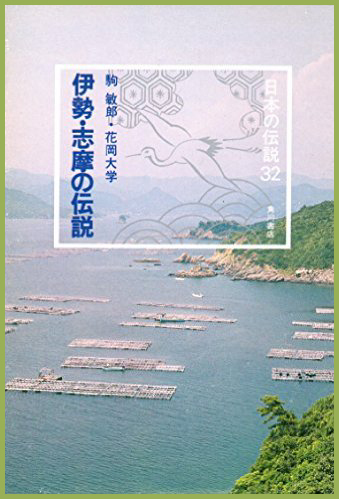 『大倉島の竜宮』- 『志摩の豊玉姫ものがたり』- 『ガンガン井戸と馬乗り石』など . . .
. Hebigami 蛇神と伝説 Legends about the Snake Deity, Snake God . Ikegami 池神 Srepent "Deity of the Pond"